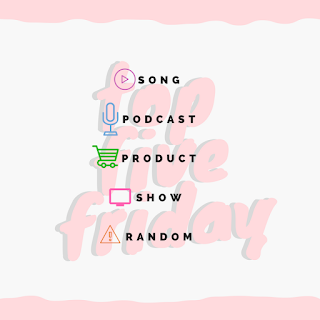 Top Five Friday : Already? Gretch Runs: Top Five Friday : Already? I seriously can't believe that it's Friday already! Dan and I went on a little trip to Cincinnati this week, so all day yesterday (my first day back at work), it felt like a Monday. I won't complain that the weekend is already here :) I'll be sharing a bit about our trip below, but look for a full post coming soon! It was such a fun trip and I got to cross something off my bucket list, so I can't wait to share more. I hope you all had a great week as well! A few weeks ago, my music obsession was Wisin, and now it's his old duo partner Yandel is coming out with new music. I love this song, which has a completely different sound than Wisin. This doesn't really have a hard beat like most reggaeton music, and I can't wait to hear more songs from his upcoming album (which includes a song with Wisin)! This has definitely been one of my favorite podcasts from the past year, and I always look forward to new episodes coming out every week. Some times they interview famous runners (like a recent episode with Desi Linden), but other times a few experts just discuss one topic in a round-table format. This week's episode was all about running your best fall race, which is coming at the perfect time for me since I just started training for my next half. The advice is all great and the episode is very informative! At the beginning of a training cycle, I like to treat myself to a new piece of clothing to help keep me motivated and excited to start running. This time around I picked up a new pair of shorts from Lulu- the Tracker Shorts! I like these because they are a bit longer than the Speed Shorts (which I always feel like I have to make sure aren't exposing anything to runners behind me!!) and has a larger pocket on the side. The material is really comfortable for running, and they keep me nice and cool in this warm, humid weather. What more could you want from a pair of shorts?! Since I was traveling this week, I didn't really get to watch any TV. I did catch up on Big Brother though, and I love a good double eviction night! Even though there's a lot of drama going on in the house, I feel like there's not a single person that I'm really rooting for. It seems like Paul is the only one playing the game, and everyone else is just following his advice. I hope that changes soon! The reason that we went to Cincinnati this week was to watch a tennis tournament- the Western and Southern Open! I've been a fan of tennis for a while now (even if I don't play), so I was so excited to go to my first tournament. It was so much fun to watch the matches in person and to meet a few of my favorite players! The tournament is still going on, and is the last big match before the final slam of the year- the US Open. I can't wait to see if a "Next Gen" star will win it (GO ZVEREV!!) or if Federer/Nadal will end their magical year on a high note. Who else is watching Big Brother? That's a cute skirt! I hope it gives you the motivation you need this fall! Oh I was WONDERING where all the tennis videos were coming from on your Instagram! You love tennis! That must have been the BEST TIME for you guys! I am so annoyed with this season of Big Brother. I am sick of Paul and I am sick of everyone just letting him control things!!! It's infuriating! I'm not sure if I could handle a Grand Slam now...this one was big enough for me!! So cool that you almost got to go to Roland Garros! That must have been a fun school trip.